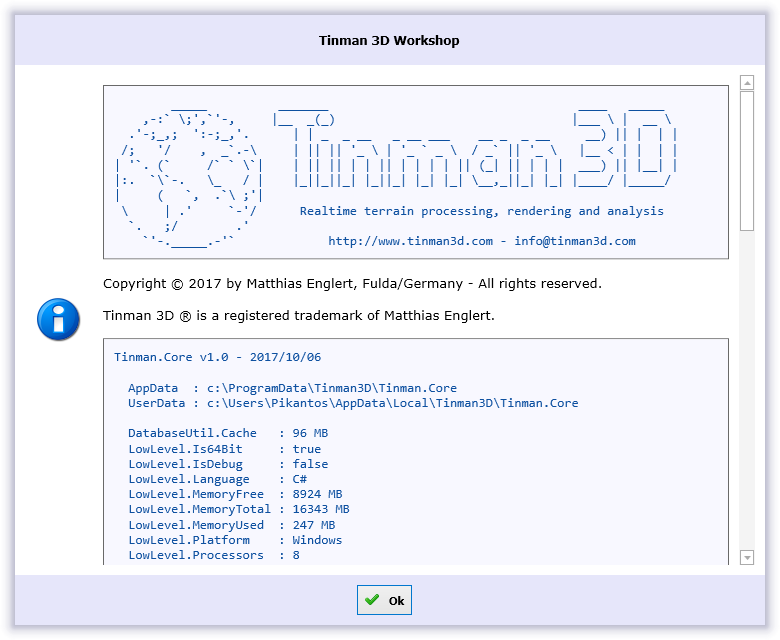 The Tinman 3D Workshop Application provides users with a sandbox GUI environment for exploring the features of the Tinman 3D SDK. The Tinman 3D SDK offers its functionality by providing native C# and C++ APIs, which can be used separately. A subset of this functionality is exposed via the ConfigScript API (see Reference), which the Workshop wraps in a slick GUI. 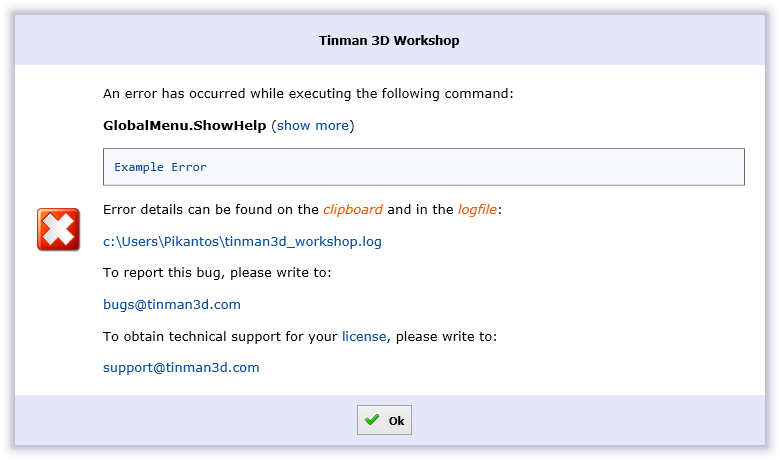 A logfile is written to each time the Workshop runs (tinman3d_workshop.log). The full path to the logfile is indicated in the console output. Errors are indicated with [E], warnings with [W]. During normal operation, neither errors nor warnings should occur. Shows the application menu (see About Box). Activates and shows the tool window. Creates a new empty project. (*.twp). Opens an existing project (*.twp). Saves all changes (project and scripts). Adds a new empty script to the project. Adds an existing script to the project. Removes a script from the project. Saves the current window layout. Restores the default window layout. Group config scripts (see ConfigScript) into projects (see ConfigDomain). Use the source code editor for creating config scripts. Errors, warnings and other infos are provided instantly, for example syntax errors or validation problems like missing files. Quickly explore all existing scripting types (see ConfigType). The help browser display the documentation for the current context (see ConfigDoc). Inspect native objects (C#, C++), that have been created from a config script (see IConfigurator and IConfigurable). Browse and edit native objects (C#, C++) visually, using an interactive embedded application (see IApplication resp. IWidget). The ConfigValueBrowser API is used to create applications for native object which have been created from config values. 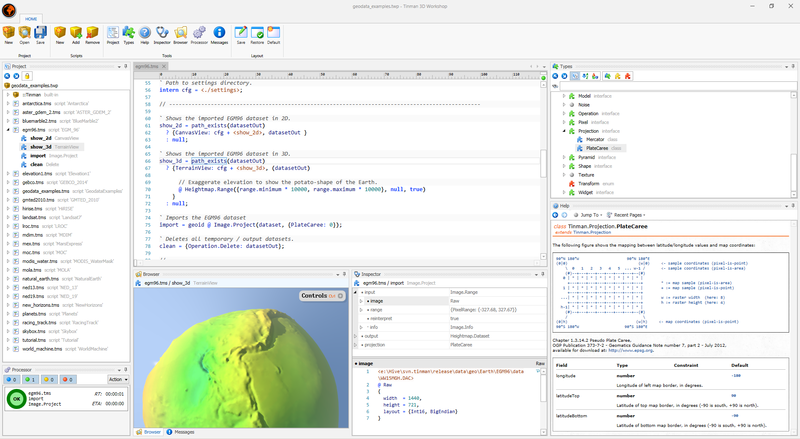 Runs processing jobs in the background (see IOperation), for example geodata processing or data import. 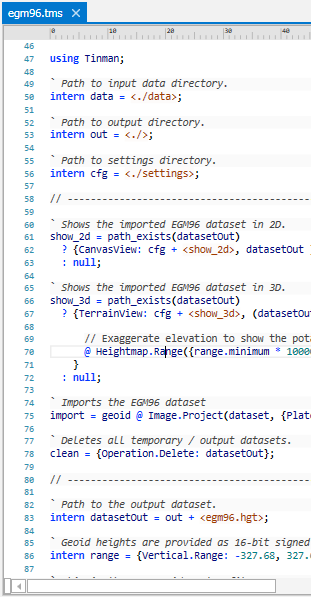 You can also use the command-line Geodata Processor for this. 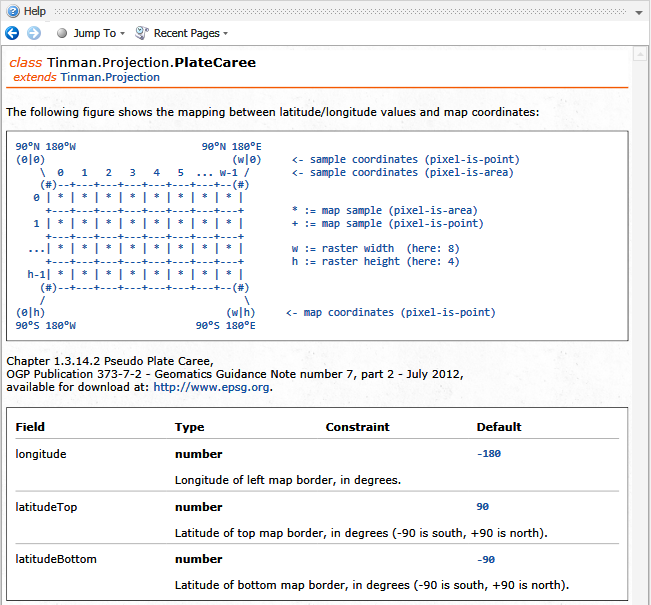 The Project Explorer shows the model tree of the currently loaded Tinman 3D Workshop Project (*.twp). The first tree level displays the Tinman 3D Workshop Script Files (*.tws) that are associated with the project. The ConfigScript class is used to parse the script files. The scripts of a project at put into a ConfigDomain instance, which allows them to reference each other's members. The second tree level lists the members (see ConfigMember) of each script. Collapses all nodes of the project tree. Expands all nodes of the project tree. Shows or hides internal script members (see ConfigMember.IsIntern). Shows the name of the current project file. Double-click to browse to the project directory. Show the documentation of the type of the script member. Shows the source code of the member in its script window. Inspects the script member (see ConfigValueBrowser.Inspect). Browses the script member (see ConfigValueBrowser.Browse). Processes the script member (see IOperation). Opens the folder that contains the script file. Closes the Script Editor window of the member. The Script Editor is used to edit script files. Show the documentation of the type of the expression. Locates the item in the Project Explorer. Imports a file into the script as a new member. Closes the source code window of the selected script file. If the selection is empty, the whole text line containing the cursor is copied. Cuts the selected text to the clipboard. If the selection is empty, the whole text line containing the cursor is cut. Ctrl + L Cuts the whole text line containing the cursor to the clipboard. Ctrl + V Replaces the selected text with the clipboard content. Ctrl + Y Performs one redo step. Ctrl + Z Performs one undo step. The Message List windows shows all errors and warnings that have been generated for the script files in the project or the value being browsed resp. inspected in the Browser resp. Inspector Tool. Errors and warnings are generated by using the Validator class and friends. An error message (see ValidateMessageType). Use the toggle button to show/hide error messages. Messages from the Browser Tool, regarding the value that is currently being browsed. Use the toggle button to show/hide Browser Tool messages. A warning message (see ValidateMessageType). Use the toggle button to show/hide warning messages. Messages from the Inspector Tool, regarding the value that is currently being inspected. Use the toggle button to show/hide Inspector Tool messages. Use the toggle button to show/hide information messages. Messages from the Script Editor windows, regarding syntax and semantic errors in the script. All scripts in the project, only Open scripts, only the Current script or None. The Type Explorer shows all ConfigType instances, and provides filtering and search functions. Collapses all nodes of the type tree. Expands all nodes of the type tree. Shows the config types by their full name tree, e.g.Tinman.Operation.Delete. Shows the config types by their flat names, e.g. Delete. Shows the config types by their inheritance tree. Shows / hides ClassType instances that are no structure types. Shows / hides ClassType instances that are structure types. Shows / hides EnumType instances. Filters the current tree content, showing only those items that match the given input. The Help Browser shows the documentation of the config types (see ConfigDoc). The Inspector Tool shows the ConfigValue hierarchy of the inspected value. The lower part of the property grid shows the textual representation of the selected ConfigValue. Indicates that a field of a ConfigValue that has a non-default value. Indicates that a field of a ConfigValue that has a default value. Indicates an external field of a ConfigValue, i.e. the field value is computed by native code instead of being configured by script. Show the documentation of the type of the inspected value. Locates the inspected value in the Project Explorer. Shows the source code of the inspected value. Inspects the browsed value (see ConfigValueBrowser.Inspect). Imports a file into the Browser for being browsed. Opens the folder that contains the file that is being browsed. Closes the Browser view, which disposes the browsed value. The Browser Tool runs an IApplication object, using a WPF application host. Browses the inspected value (see ConfigValueBrowser.Browse). Imports a file into the Inspector for being inspected. Opens the folder that contains the file that is being inspected. Closes the Inspector view, which disposes the inspected value. The Processor Tool shows the IOperation objects that have been created and run from script members. Click toggle button to show / hide running jobs. Click the job item to cancel it (you will be prompted first). Click toggle button to show / hide finished jobs. Click the job item to close it (you will be prompted first). Click toggle button to show / hide canceled jobs. Click toggle button to show / hide failed jobs. Click the job item to display the error message. Choose a drop-down item to quickly close job items. Running jobs cannot be closed, they must be cancelled first. Show the documentation of the type of the job item. Locates the job item in the Project Explorer. Shows the source code of the job item in its script window. Inspects the job item (see ConfigValueBrowser.Inspect). The following sections describe the various dialog windows that are used by the Workshop. Dialog Windows can be interactive; in this case there will be hyperlinks in the dialog content, which can be clicked to perform the described action. The About Box window shows a system information dump (see TinmanModule.SystemInfo). You can reach the About Box from the Application Menu. The Abount Box can be used to quickly determine which 3rd-party libraries and plugins have been detected. For the Workshop, this primarily affects the set of available file formats (see FileFormat) and config value browsers (see ConfigValueBrowser). This is a text file that contains the Tinman 3D Licence Key of the user. This file is created resp. overwritten when the user provides a new key via the Licence Key dialog window.. These settings will be read on startup and written on shutdown; so any manual editing should take place before the Workshop is started. A valid User, Site or Academic licence key is required to run the Workshop. 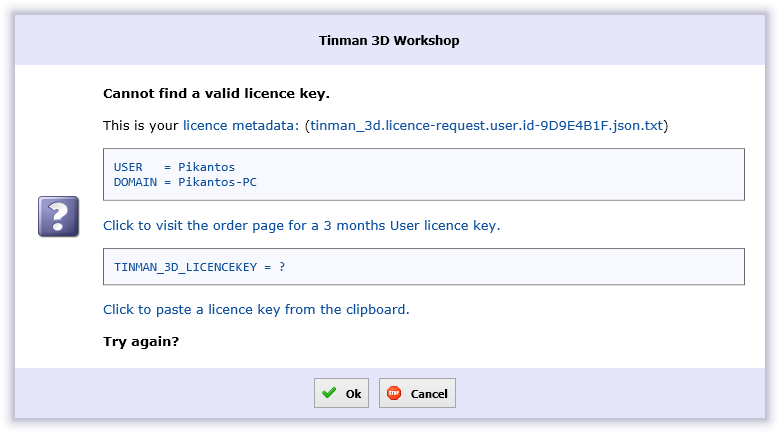 Licence keys are taken from the TINMAN_3D_LICENCEKEY environment variable and from the %LOCALAPPDATA%\Tinman3D\Tinman.Workshop\licence-key.txt file. The Licence Key dialog is displayed if no licence key has been found or if none of the licence keys is valid (e.g. expired). If you close a script, project or the Workshop, you will be prompted if there are any unsaved changes. You can toggle which changes to save and which ones to discard, by clicking on the displayed dialog actions. When modifying script files both in the Workshop and in some external editor, conflicting changes may occur. In this case this dialog will be displayed. Use the dialog action to choose which external changes to apply and which ones to discard. When importing a file into a script, the Browser or the Inspector, this dialog will be displayed. Use the dialog actions to choose how to import the file. If an unexpected error occurs, this dialog will be displayed. A detaild error description will have been copied to the clipboard when this dialog is shown. The same information can be found in the logfile. It must be a DOT.NET >= 4.5.1 assembly. It must use the same Tinman assembly versions as the hosting Workshop (see About Box). It must define an own subclass of TinmanModule (please refer to the AddOns source code for examples). Additional image formats (see ImageFormat). Additional vector foramts (see ShapeFormat). 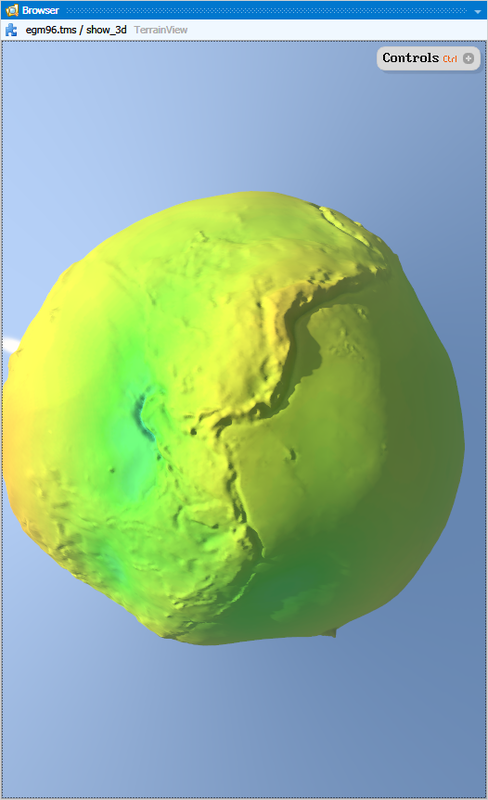 Additional 3D model formats (see ModelFormat). Configures logging (see LoggingUtil.BasicConfiguration) with the severity level Trace. Configures logging (see LoggingUtil.BasicConfiguration) with the severity level Debug. Configures logging (see LoggingUtil.BasicConfiguration) with the severity level Info. Opens a console window and outputs log messages to it, in addition to logfile output.